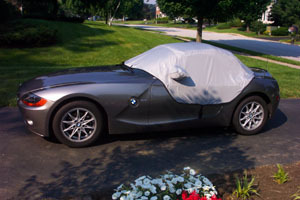 Roof Covers from RoadsterSolutions for BMW Z3, BMW Z4, Porsche Boxster, S2000, MINI Cooper, and Ford Thunderbird. 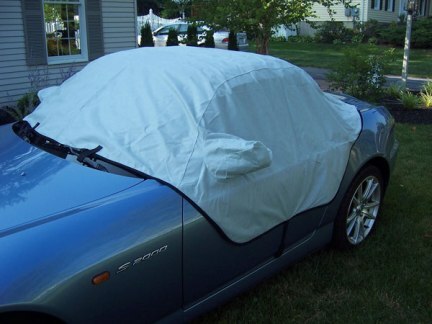 This is a great way to protect the sides of your vehicle from those dreaded door dents. 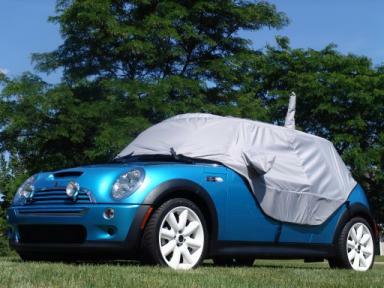 Now available for both MINI hardtop and convertible NOT the new roadster or coupe! This compact cover does it all and doesn't take up the whole trunk. 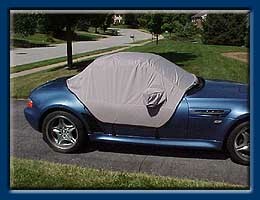 Made from WeatherShield fabric is offers great UV light and heat proection for your interior. 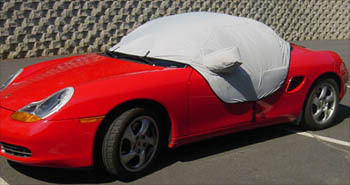 The unique padded side panels reduce the chance of door dings. Quick to install. Very secure. Shown in blue, other colors available; gray, black, taupe, royal blue, light blue, yellow, green, red. Order now! Also fits the new 2007-later Mini. Front attachment straps are positioned for left-hand drive cars. Select color on checkout, $10.00 is added for special order colors. This cover is a special order, please allow up to 4 weeks for delivery. Click " HERE" for more information about the fabrics used in our covers. NOT available for the NEW MINI coupe or roadster. Now available for both MINI hardtop and convertible NOT the new roadster or coupe! 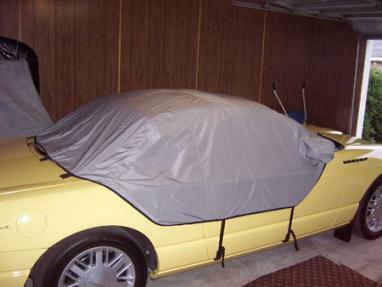 The MINI Roof Cover is made of WeatherShield, the highest quality cover fabric available. 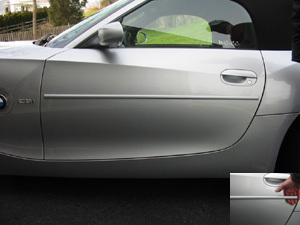 Select hardtop or convertible on checkout. Our innovative design works top up or down. 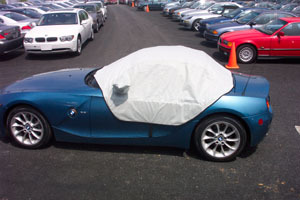 WeatherShield is an advanced technology fabric that offers maximum performance in: compact storage, door ding protection, heat reflection, UV light blocking, water resistance, and dust blocking. This unique design allows for superior strength, door protection and easy installation. Storage bag included. Will not take up your whole trunk! Available in; gray, taupe (tan), black, red, light blue, royal blue, green, and yellow. Select color on checkout. Allow up to 4 weeks for delivery, $9.00 is added for special order colors. Please note; dark colors may fade if exposed to sunlight for prolonged periods. Also fits the new 2007 Mini. Front attachment straps are positioned for left-hand drive cars. Click " HERE" for more information about the fabrics used in our covers.